Another back-to-school photo. Two girls in university: one in fourth year and one in first. 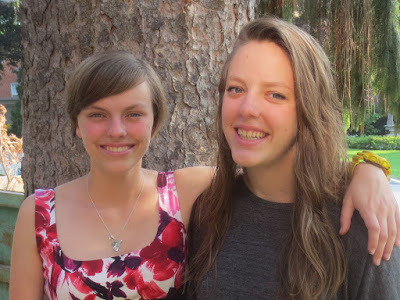 I am so proud of my two young women. On this last weekend of summer/first weekend of fall, I have to share one of my favourite recipes from the summer. These wonderful roasted green beans with cremini mushrooms are a classic. I made them the first weekend the fresh local green beans showed up in the farmers’ market, and I’ll be making them until they’re gone. Preheat the oven to 475 degrees. Line a large baking sheet with a piece of parchment paper. In a mixing bowl, toss the mushrooms thoroughly with 2 Tbsp of olive oil and 1/2 tsp salt. Spread out the mushrooms in one layer, cut side down, on one end of the sheet pan. (They can be close together.) Toss the green beans with 1 Tbsp olive oil and 1/2 tsp salt. Spread the green beans out in one layer on the rest of the pan. Roast until the green beans are shrunken and very wrinkled, and the mushrooms are tender, shrunken, and beginning to brown, about 25 minutes. Meanwhile, put the remaining 4 tsp oil in a small nonstick skillet along with the garlic, rosemary, and red pepper flakes. Bring to a simmer over medium-low heat. Once the oil starts bubbling, cook for 1 minute to infuse the oil with the flavours and to soften the garlic. Remove the skillet from the heat and let sit while the vegetables finish cooking. Transfer the cooked vegetables to a mixing bowl. Scrape the seasoned oil out of the skillet and over the vegetables; toss thoroughly. Transfer to a serving platter or dinner plates. Love yours Roasted green beans Beth ! Mary Oliver's words are like a warm blanket that I want to wrap myself up with & never remove. Gorgeous words. And, as usual, your recipes make me crave veggies + savoury things, instead of sweets! What a beautiful post! Your girls are so lovely! Lots to be proud of. Mary Oliver and and an awesome recipe! Thanks Beth! 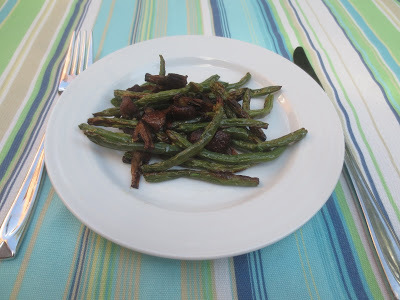 Green beans with mushrooms is one of my all-time favorite side dishes! I just had a large portion of green beans for the lunch too. I love the combination of mushrooms and beans..it certainly looks very delicious and healthy. Loved the picture of your girls. This recipe sounds like one I must try. Thanks. Congratulations to your two daughters! The one with the flowered dress looks exactly like you! The beans and mushrooms sound perfect to me! Thanks, Katerina! People tell me that quite a lot, which is obviously a huge compliment to me! Hope you have a great day. Farmers' market green beans are the best! I also love roasting them – I don't think many people think to do that. SO flavorful! Dear Beth, beautiful girls – what a stunning picture! 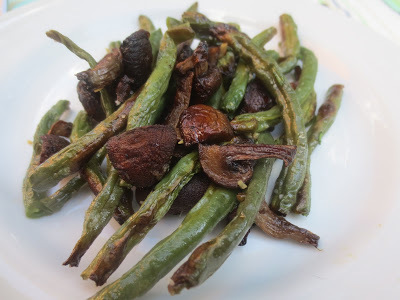 And, yes, the Roasted Green Beans and Mushrooms look exactly like the type of vegetable dish that I adore so much! What a lovely post dear friend! Wow I am so happy to stumble across your blog. As the babysitter to dear Emily and Rachel when they were (3 and 6 months?) it's amazing to see them all grown up and at university. Congrats to all of you and lots and lots of love! Good luck to the girls on an exciting year ahead!! And this is absolutely my kind of side dish. Delicious! P.S. Your girls are beauties. Thanks, Liz! I think so too! And Grace, I love everything about you but I still can't figure out why you don't like mushrooms! Amy, so nice to hear from you! Do you remember coming to the Nutcracker with us one Christmas? You were a world-class babysitter and the girls loved you. I'll be in touch! Your daughters are lovely, Beth. and I liked the poem. Beautiful poem (and timely for me too of course). Great picture–makes me think of the kindergarten first day of school pictures. Loaded with green beans right now too! What a beautiful poem that's so fitting for your two beautiful girls. Good luck to them on another school year. My husband and son love green beans and one of these days I need to try this recipe. Thanks Beth! I have such problems with that let it go part! Beautiful girls, Beth! And love these green beans!